A rare blue lobster was caught off Castine in this September 2010 file photo. A Maine father-daughter team captured a blue lobster on Saturday. MANCHESTER, New Hampshire — A Maine teenager and her father have landed a 1-in-2-million catch: a blue lobster. Meghan LaPlante, 14, said she and her father pulled in the vivid blue crustacean from one of their traps on Saturday. LaPlante helps her father run the family’s Miss Meghan’s Lobster Catch business in Old Orchard Beach. The blue color is the result of a rare genetic mutation that causes the lobster to produce an excessive amount of a particular protein. Most lobsters are dark bluish green to greenish brown. Scientists estimate the blue coloring occurs in only one out of 2 million lobsters. LaPlante and her father have agreed to donate the lobster to the Maine State Aquarium. 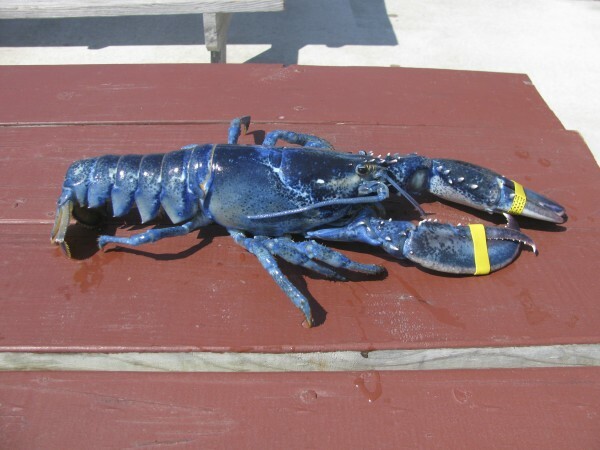 LaPlante said she named the lobster “Skyler” for its blue color, and because it’s one of her favorite names.